3 Bedroom Detached House For Sale in Lightwater for Asking Price £899,950. A truly stunning three double bedroom, three bathroom detached house situated within a hugely desirable location. The property has been completely re modelled and carefully re designed by the current owners. 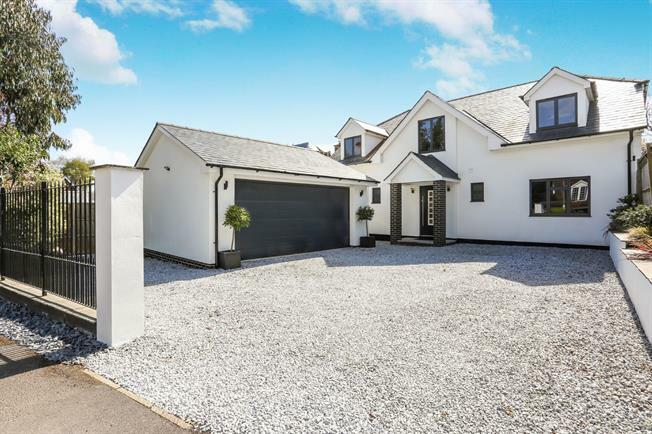 The specification throughout the home is of the highest quality and internal viewings really are a must to fully appreciate this beautiful executive home. As soon as you step through the front door you are greeted by a wonderful size entrance hall with a beautiful stair case which leads through to the most incredible open plan kitchen, diner, family room ideal for entertaining. The kitchen has bi fold doors across the entire rear of the property which leads onto the rear garden and flows into the formal reception room which is a wonderful size and boasts a log burner. Further accommodation downstairs is a spacious utility room, downstairs cloakroom and bedroom three which is ideal for guests and also comprises a spacious en suite shower room. Upstairs accommodation offers two excellent size double bedrooms both with en suites. The master bedroom is a particular feature of the property, boasting 'his and hers' walk in wardrobes and an incredible walk in wet room. The rear garden has been cleverly designed to be low maintenance and ideal for out door entertaining with a large decking area leading to artificial grass. To the front of the property offers ample driveway parking for a number of vehicles leading to a double width garage with an electric door. Internal viewings are a must.